Have your child help with the birthday preparations by making a Birthday Balloons Card. This can be used for invitations, thank you notes, or as a cute homemade birthday card! This is a great card craft for toddlers and preschoolers, and besides, who wouldn't love to receive a card with little thumb prints all over it? 1. Cut your paper to the size you would like your card or invitation. Write your message on the front. 2. Pour a small amount of each color of paint into a shallow dish (a paper plate works well for this). You have two options for making the balloons: 1) Lightly dip a finger in paint and press it onto the card, or 2) brush the paint on a finger using a paint brush and then press on to the card. Option 2 works better when you are using a thin paper like thin construction paper or regular note paper (big blobs of paint will ripple the paper). You can use different thumbs/fingers for each color of paint, or wipe in between. 3. With a marker draw on the balloon strings. When they are dry write the information or message inside. 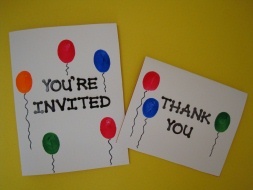 If you are doing invitations you can also trace the outline of a regular envelop on a piece of card stock. Cut it out and write all the information for the party on one long sheet, and then make your balloons around. Stick it in the envelop and send it away! OR, buy a card making package at the craft store, these are reasonably priced and come with plain card stock cards and matching envelops. If you want to add a little more pizazz, mix a couple of drops of glue into your paint, make your balloons, and then have your child sprinkle some loose glitter onto the balloons, shake off the excess and you've got sparkly balloons!